Answering questions about the shift in cardiology from inpatient to outpatient procedures. Figure 1. Medicare payments to physicians for hospital cardiology services. Reprinted with permission from Truven Health Analytics. Shifts in Cardiology Treatment. Media Health Leaders-Fact File. Accessed March 8, 2017. This outpatient shift highlights the maturation of PCI procedures and the implementation of best practices based on years of research and data. Procedures such as PCI are now performed with increased safety due to the use of radial access, less contrast material, bleeding risk assessment, better anticoagulation options, and improved disposable products. 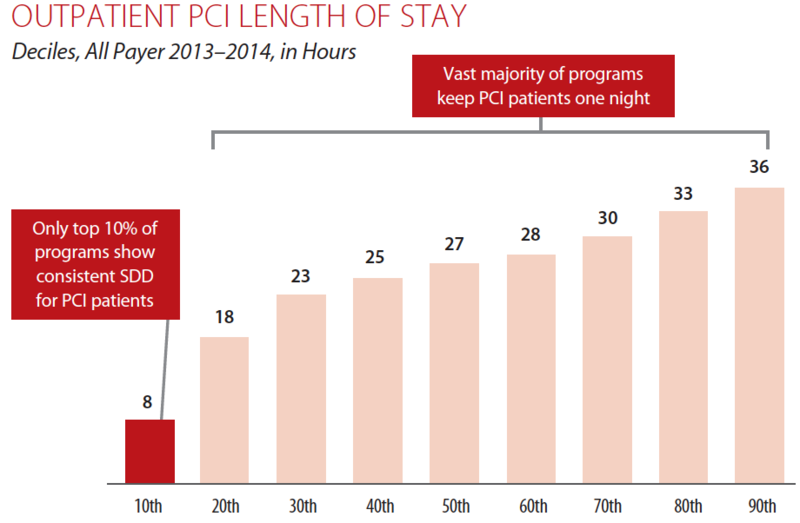 In elective PCI, these improvements continued to shorten length of stay (to an overnight event for most patients). As a result, in 2008 the Centers for Medicare & Medicaid Services reclassified uncomplicated elective PCI procedures from inpatient to outpatient procedures. Figure 2. Outpatient PCI length of stay in hours. Reprinted with permission from Advisory Board. Why you should be working toward same-day discharges for PCI. https://www.advisory.com/technology/crimson-continuum-of-care/members/ expert-insights/same-day-discharge-for-pci. Accessed March 8, 2017. The move to outpatient PCI procedures has been more of a paper or coding exercise than a clinical change. According to the Advisory Board, only 10% of programs have PCI patients who recover and are discharged in 8 hours or less.2 Despite the change in coding practices, most elective PCI patients still stay overnight as outpatients in inpatient hospital beds. The primary reason for the continued overnight stay is physician concern with the safety of same-day discharge (SDD) for PCI patients. Until this hurdle can be overcome, the ability to shift elective PCI outside the acute care hospital will not occur (Figure 2). Criteria and research is available to help cardiologists understand the safety and economic implications of SDD for elective PCI patients. The most widely referenced SDD guidelines were released by the Society for Cardiac Angiography and Interventions (SCAI) in 2009.3 Programs that use these guidelines as a screening tool to determine SDD eligibility find approximately 20% to 40% of elective PCI patients are candidates for SDD. Having such variability in length of stay makes it difficult to effectively move this outpatient population to the ambulatory setting, where lengthy or overnight stays are not expected. Programs that achieve the SDD rate in the 80th to 90th percentiles use very streamlined criteria based on years of working with and adjusting SCAI’s original guidelines. These programs determine discharge eligibility based on the patient’s response to the procedure; they prep all patients to go home on the day of procedure, but the actual decision for discharge eligibility is not made until the procedure is complete. For many programs, until there is greater confidence in predicting SDD eligibility preprocedure, assignment to an ambulatory setting versus an acute care center will remain a challenge. Patient safety and regulatory requirements drive the discussion regarding ability for PCI to migrate into the ambulatory setting. State-by-state regulatory requirements must be carefully reviewed prior to embarking on ambulatory cath lab strategy. In addition to regulatory restrictions, other valid reasons exist as to why elective PCI still occurs almost exclusively in the acute care center. The barriers to moving elective PCI to the ambulatory setting are integration of cardiology programs with health systems, capacity in acute care cath labs, the growth of emergent and urgent PCI volumes operational issues around ambulatory cath labs, and the declining volumes of elective PCI work. Ambulatory cath labs were faced with challenges early on as reimbursement for diagnostic cath procedures was in a steady decline. During the same time, ambulatory sites experienced a reduction in reimbursement while hospital reimbursement grew slightly. This economic picture led to many physicians either divesting in ambulatory labs or selling to the hospital system. The exception to this trend was ambulatory cath labs that performed both diagnostic cardiac and interventional peripheral procedures. Peripheral reimbursement in the ambulatory setting increased more favorably and earlier. As cardiology run cath labs began to decrease, the rate of integrated cardiology groups was steadily growing. These relationships contractually restricted the ability of employed physicians to compete directly with the health system employer. This changing landscape of reduced outpatient reimbursements for diagnostic cardiac procedures and integration of cardiologists with health systems created a negative economic picture for ambulatory PCI growth. Most hospitals are experiencing an overall decrease in elective PCI volume, which has eliminated procedural capacity constraints in many cath labs. The development of an ambulatory cath lab is not a low-cost endeavor. Assuming there is available physical space in the ambulatory center for a cath lab suite, the cost of the x-ray, emergency equipment, and supporting gear can easily be $2 million. But even when the acute care system has existing space in the hospital cath lab, moving diagnostic and PCI services to the ambulatory center becomes a difficult sell. Capital costs are a consideration, but so is safe and effective staffing in the ambulatory setting. Any staffing model must ensure the cath lab team can function at a high level should an emergency occur and transport to the acute care center become necessary. This would require frequent exposure to acute events and/or simulation at regular intervals. Hospitals that are at cath lab capacity and have the staff and physician resources to cover ambulatory sites would be in the best position to consider ambulatory expansion for PCI. The decline of predictable, elective PCIs has been replaced with a greater volume of urgent and emergent ST-segment elevation myocardial infarction (STEMI) and non-STEMI work. The impact of this change in patient population requires a cardiac interventionist and cath lab team to be near the hospital cath lab to manage frequent inpatient and ED add-ons. This has become such a priority that some hospitals staff the cath lab 24 hours a day, 7 days a week. The elective PCI patient is the intended patient for the ambulatory setting, but that volume has been declining. The reason for the decline in low-risk elective PCI has been attributed to improved medication management, drug-eluting stents, and appropriate use criteria. The ambulatory setting needs the elective PCI volume to fund the business model. The hospital cath lab schedules use these same elective outpatients to begin their days until the inpatient rounds and test results are back and cath lab add-ons are generated. The inpatient add-ons from transfers, chest pain centers, and traditional inpatient units have grown to represent as much as 50% to 60% of the PCI volume in many cath labs. The reality of this scheduling situation is that the cardiac interventionists’ case volume is heavily dependent on inpatient activity, making staffing an ambulatory center less appealing. The challenges to moving elective diagnostic and interventional cardiac procedures from the hospital to the ambulatory setting are considerable. These challenges are equally countered by pressures to reduce the overall cost of care from both payers and consumers struggling with ever-growing out-of-pocket responsibilities. The ambulatory setting will be a natural progression for programs with the right regulatory requirements, mix of elective case volumes, capital funding, and physician and staff coverage. 1. Truven Health Analytics. Shifts in cardiology treatment. Media Health Leaders-Fact File. http://truvenhealth.com/Portals/0/Assets/fact-files/Shifts_Cardiology_Treatment_May_Fact_File_2016.pdf. Accessed March 8, 2017. 2. Advisory Board. Why you should be working toward same-day discharges for PCI. https://www.advisory.com/technology/crimson-continuum-of-care/members/expert-insights/same-day-discharge-for-pci. Accessed March 8, 2017. 3. Chambers CE, Dehmer GJ, Cox DA, et al. Defining the length of stay following percutaneous coronary intervention: an expert consensus document from the Society for Cardiovascular Angiography and Interventions. Endorsed by the American College of Cardiology Foundation. Catheter Cardiovasc Interv. 2009;73:847-858. 4. Miller S, Society for Human Resource Management. Study: using ambulatory centers reduces outpatient costs. https://www.shrm.org/resourcesandtools/hr-topics/benefits/pages/ambulatory-centers-cost.aspx. Accessed March 8, 2017. Current indications for antiplatelet agents and NOACs after Watchman implantation. A closer look at current technology as the indications for PFO closure become clearer. A look back at the long road to FDA approval and the implications on patient care options going forward. Considerations when choosing an oral anticoagulant, antiplatelet therapy, or closure device for recurrent cryptogenic stroke prevention when a PFO is present.